Today most people, and most coffee house establishments, make their hot chocolate drink with powdered drinking chocolate, hot water and a dash of milk, as they would an instant coffee, but this is not the historic drink once known simply as Chocolate. Yet the recipe and methods used to make a proper Hot Chocolate Drink have not changed much since the early 1700s. ‘Chocolate’, as a drink made with boiling milk, is a British recipe from the 1690’s. It came from adding milk when Sir Hans Sloane, (of ‘Sloane Square’ in London) on a trip to Jamaica in the 1690s found the drink was too bitter made with just water and so asked instead for it to be made with hot milk. He brought this recipe back to London where it rapidly spread. To make the drink ‘Chocolate’, once so popular, a piece of dark chocolate, (sold in large, thick ‘cakes’) was scraped with a knife, and the scrapings were used as an ingredient in the hot drink. In mainland Europe the chocolate was often mixed with water (both hot and cold) to drink, while in London the coffee and chocolate houses used boiling milk, (and have done since the 1700s, and well into the late 1800s) and this is the authentic recipe we will be making. This will make two cups of ‘Chocolate’ to the ratios and instructions of the 1850 recipe – to make more just scale up the ingredients using the same ratios. You need to buy a bar of very good quality dark chocolate, above 80%, to make this an authentic drink, and follow the correct method to make it; Chocolate has been made this way since the 1700s, but this is now sadly missing in most shop bought hot chocolate drinks. Put two heavy based saucepans on a medium heat. In one saucepan add a few inches of water, and put a heat proof glass mixing bowl over it so it does not touch the water. Into the glass bowl add the chopped dark chocolate and two tablespoons of water, the chocolate should melt gently in the bowl over the steam, stir only occasionally. In the second saucepan add the milk and bring it to just under a boil, then stir in the sugar. Note: the sugar can be left out entirely for individuals to add to their own taste when served. By melting the chocolate this way, and not adding it straight into the milk to melt, you will achieve a much creamier and smoother hot chocolate drink, and it is well worth the extra washing up. Once the sugar has dissolved into the milk, and the milk is at the boil, and the chocolate has melted in the glass bowl, stir the milk into the chocolate, a little at a time. Keep the bowl over the steam and stir continuously for a few minutes until everything has mixed in well. 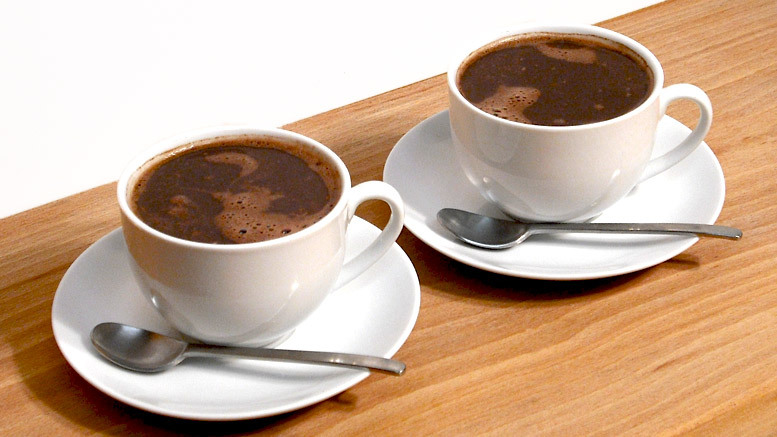 Pour (or ladle) the hot chocolate drink into heat proof mugs or glasses, allow to cool slightly and drink warm. To get it frothy, as described by Alexis Soyer in 1850, use a small frothing whisk (replicating the Victorian stirring muller) before serving – either whisk it in the bowl or carefully in the cups. Nothing else needs to be added or made to go with this Chocolate drink, it is perfect as it is. Cut a cake of chocolate in very small bits; put a pint of water into the pot, and, when it boils, put in the above; mill it off the fire until quite melted, then on a gentle fire till it boil; pour it into a basin, and it will keep in a cool place eight or ten days, or more. When wanted, put a spoonful or two into milk, boil it with sugar, and mill it well. This, if not made thick, is a very good breakfast or supper. Scrape two ounces of the cake, which put into a stew or saucepan, with a gill of water, upon the fire, keeping it stirred with a wooden spoon until rather thick, when work it quickly with the spoon, stirring in half a pint of boiling milk by degrees; serve very hot, with sugar separate. Procure a reafu-lar chocolate-pot with a muller, the handle of which comes through the lid, one might be procured at any brazier’s, put in two ounces of chocolate (scraped), over which by degrees pour a pint of boiling milk, put on the lid, with the muller inside, which keep well moving, setting the pot upon the fire, and when very hot and frothy, serve.